When T. moved in two years ago he was he was two and a half years old. He could sign the words “more” and “milk”. He could also say, “What’s that?” Unfortunately, it took us a couple weeks to figure out what he was saying. Over the course of the last two years there has been much discussion by family members and speech therapists about when he will talk. By that I mean talk in a typical sense – in a way that is understandable all of the time. The conversations are about some deficit. Some lack. Some fear. Some problem. Ward and I have remained resolute that he will when he does. Part of that has to do with the fact there were so many milestones T. had to master that focusing exclusively on one was not an option. When he arrived he didn’t walk, he crawled. He was in the 25% percentile of weight and height for Down syndrome boys – he was 22.7 pounds and 32 inches. He had just had his life upended for the third time in 2 years. We decided everything he did was awesome. The fact he didn’t curl up in a ball of defeat seemed to be evidence that this was an extraordinary person. The focus would be what he did – not what he didn’t. During the last two years T. has learned sign and often says the word he is signing. At home he does this all the time. In the world he does it when he is comfortable and when he feels safe to take chances. The talkers of the world like fast communication. People who are learning to talk aren’t about fast. That was our four-year old son’s first sentence in spoken word. It was a delight to hear. I yelled, “You said, I’m going to read book!” Ward yelled from the kitchen, “I heard that out here!” T. smiled and hopped up on the coffee table and started reading a book. Be here now is where it’s at. 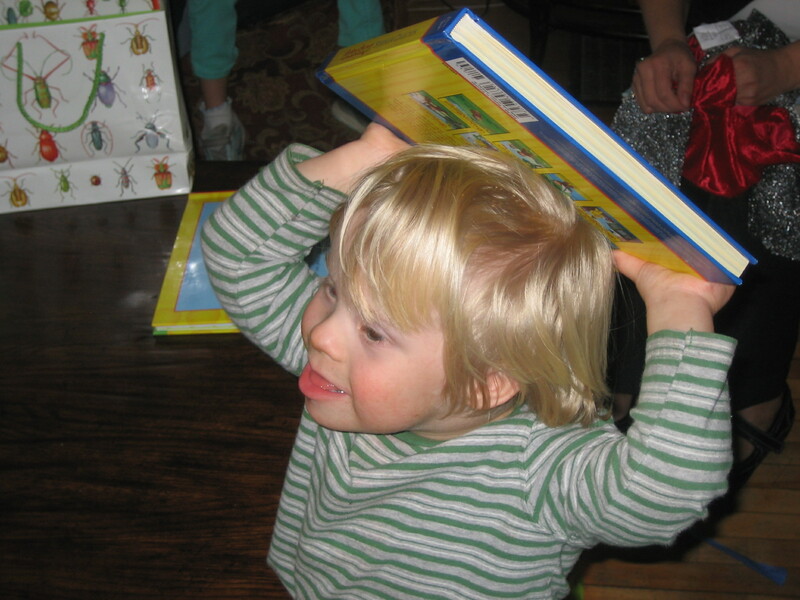 This entry was posted in Adopting, Advocacy, By Notatypicalmom, Down syndrome, Random life, Special Needs by Kari Wagner-Peck. Bookmark the permalink. I love reading your blogs….they are always so interesting. You two are doing such a great job of being parents!!! I can’t wait to meet T. Let me know if you will be coming to EC this summer!! I would love to have you come over!! Been trying to get your Mom to come out here, now that it is nicer out!!! That is great that T. loves books!! Keep on with the reading!! Our girls loved books and still do!!! Thanks for reading and commenting! Oh, we will visit when we come out. You have a good weekdend, too! K.
joy and hope! Thank you! When I read this I could SEE YOU yelling that, I could HEAR YOU yelling that, and I had the biggest smile on my face that I’ve had for a while! I could FEEL YOUR HAPPINESS! If only we could all focus on the positives in life. We could all learn something from our little people I think. Thank you for making my Monday complete! have a great week. did i yell it in a wisconsin accent? thanks! love, k.
That’s my grandson. He’s beautiful and HE LOVES BOOKS! !